Users who sign up for Chargebee after April 27, 2018 will have Dunning v2 enabled by default. Dunning is the process of retrying payment attempts when a transaction gets declined due to insufficient funds, expired cards or connectivity issues. 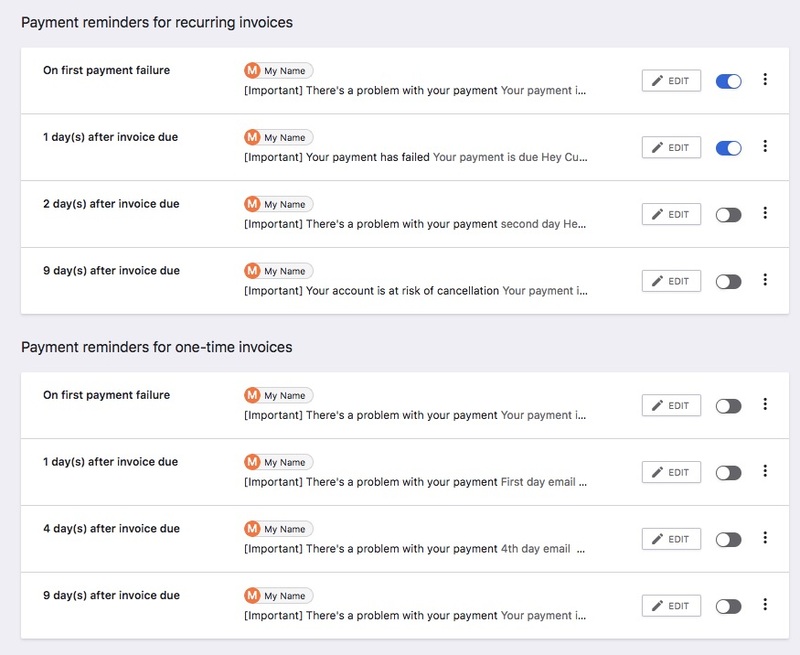 With Chargebee's Dunning feature, you can send email reminders to your customers asking them to update payment details and schedule payment retries at intervals to ensure revenue can be recovered. In Chargebee, you can configure dunning email notifications. These emails will be sent to your customers informing them about the payment failure and reminding them to make the payment or update the payment method. Enable Email Notifications v2 for your Chargebee Site. This will allow you to send multiple email reminders to your customer, irrespective of the number of dunning retries configured. Once Email Notifications v2 is enabled, navigate to Settings > Configure Chargebee > Dunning for Online/Offline Payments, and enable ‘New Dunning' for your Chargebee Site. Updating to the new version of dunning will not affect your existing settings; the existing settings will be seamlessly carried over. 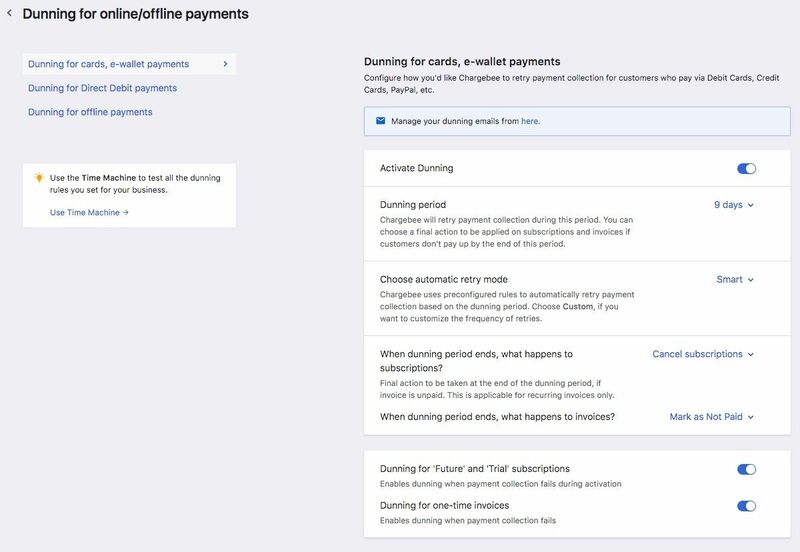 Dunning for Online Payments is when Auto Collection is turned ON for a subscription and the initial attempt to collect the payment fails, Chargebee will retry payment collection and send emails to your customer informing them about the failed payment. These settings are applicable for your customers, who use payment methods, such as Cards, PayPal and e-wallet payments like Amazon Pay, Apple Pay, etc. Activate Dunning: Enables dunning for cards, e-wallet payment methods. If this option is disabled, Chargebee will not retry to collect payments for card, e-wallet payment methods when the initial attempt fails, and the final action will be executed. Dunning Period: Dunning period is the time period (in days) during which an invoice will stay in dunning before the final action is carried out on the subscription and invoice. Chargebee will retry to collect payments during the dunning period. You can configure email notifications to be sent out to the customer within the dunning period. Final action will be executed at the end of the dunning period. Chargebee will determine the retry frequency based on past transaction data, without you having to configure it. Chargebee will retry upto 12 times to collect the payment. Along with this, if you want to set specific days/dates to retry and collect the payment from your customer, contact support@chargebee.com . This feature is available only for specific plans. Visit Plans and Pricing for more. Custom: You can set up the frequency of retries to collect the payment, in days. The max number of retries you are allowed to set is 5. Say, the dunning period is set to 8 days and the retry frequency is '1,4,8'. This means that the payment retries are scheduled for 1 day, 4 days and 8 days from the day of initial payment failure. When dunning period ends, what happens to subscriptions? : If the invoice is still unpaid when the Dunning Period ends, you can define the final action taken on the subscription. You can choose to let the subscription remain active or cancel the subscription at once. When dunning period ends, what happens to invoices? : If the invoice remains unpaid at the end of the dunning period, this option lets to choose how the invoice should be handled. Reverse the invoice, where the invoice is marked as Paid and an adjustment Credit Note will be created with reason code Subscription_Cancellation. 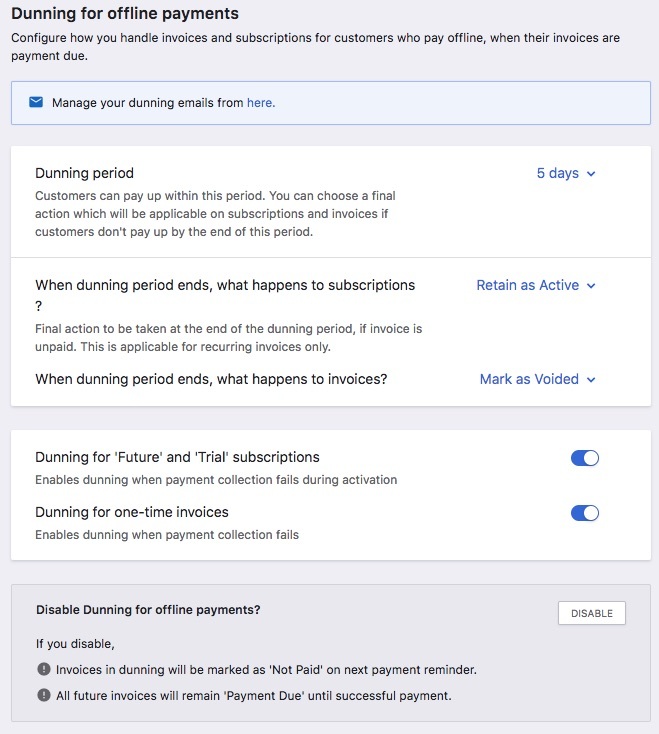 Dunning for one-time invoices: Enabling this option will start dunning for one-time invoices as well. The final action mentioned in ‘When dunning period ends, what happens to invoices?' will be carried out. However, the subscription will remain uninterrupted. This setting is for your customers who use SEPA (via GoCardless), ACH (via Stripe) or Authorize.Net) to make payments. Chargebee will attempt a maximum of 2 retries to collect payments in this case. The automatic retries, however, are not manually configurable. It usually takes 5-7 business days for the payment service provider (Stripe, GoCardless) to confirm the payment status to Chargebee. When the payment service provider confirms that the payment is failed, Chargebee will initiate the next automatic retry to collect payment. When the status of the transaction is in_progress, Chargebee will not retry to collect the payment or send email notifications. Activate Dunning: Enables dunning for direct debit payments. If this option is disabled, Chargebee will not retry to collect payment when the initial attempt fails, and the final action will be executed. What happens to subscription when dunning period ends? : This is the final action taken on the subscription if the invoice is still unpaid when the defined Dunning Period expires. You can choose to let the subscription remain active or cancel the subscription once. Enable dunning for one-time invoices: Enabling this option will start dunning for one-time invoices as well. The final action will be carried out. However, the subscription will remain uninterrupted. Chargebee allows you to collect payments offline via cash, checks, bank transfers etc. Dunning for offline payments allows you to send email reminders to the customer. Dunning Period: Dunning for offline payments is initiated the day the invoice is generated. During the dunning period, Chargebee will send email notifications configured for offline dunning. At the end of the dunning period, if the invoice is still not paid, final action will be executed. If offline dunning is disabled, Chargebee will not send email notification and the invoice will continue to remain in the payment due state. When dunning period ends, what happens to subscriptions? : If the invoice is still unpaid at the end of the dunning period, you can choose to either cancel the subscription or retain it as active. Enable dunning for one-time invoices: Enabling this option will start dunning for one-time invoices as well. The final action mentioned in ‘When dunning period ends, what happens to invoices?' will be carried out. However, the subscription will remain uninterrupted. Chargebee will retry to collect payment from the customer if their invoice is in dunning. However, if you would like to make an exception for your customer, or you were informed that the payment will be made on a specific date, you can stop or pause the dunning for the invoice in Chargebee. The option to stop or pause dunning is available in the invoice details page. If you pause dunning till a specific date, Chargebee will try and collect payment on the expected payment date. Expected payment date falls within the dunning period: Chargebee will put retry attempts and emails on hold until the expected payment date. On the expected payment date, Chargebee will attempt to collect the payment. If the payment doesn't go through, Chargebee will continue dunning with the remaining retries and email notifications. 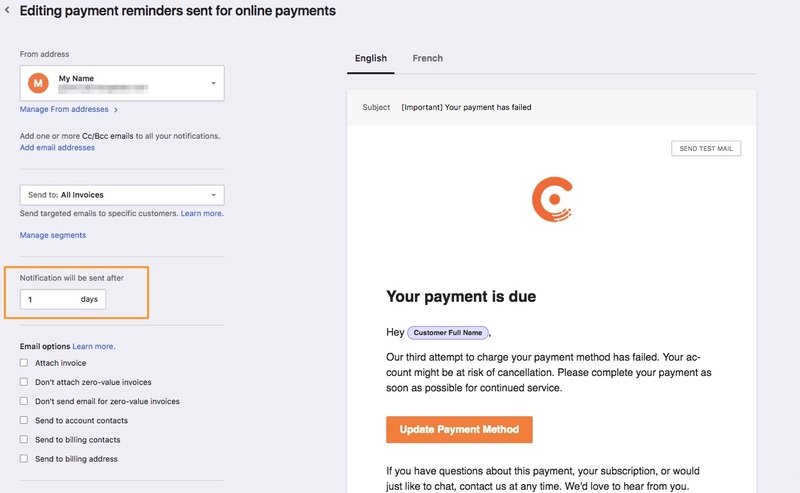 Expected payment date falls after the dunning period: Chargebee will put dunning retries and email notifications on hold until the expected payment date. On the expected payment date Chargebee will attempt to collect the payment for one last time. If the payment doesn't go through, Chargebee will execute the final action set for the subscription (cancel or retain as active). If you choose to stop dunning, Chargebee will neither retry to collect payments nor send dunning email notifications to your customers. Once stopped, you cannot restart dunning for the invoice again. The invoice will be marked as Not Paid. However, the subscription will remain uninterrupted. When you stop dunning forever, you can capture an Expected Payment Date and this information will be saved for further reference. Pause Dunning will not extend the dunning period. You can configure emails to be sent out to your customers informing them about the payment failure as well as reminding them about the unpaid invoices. The emails can be sent irrespective of the dunning attempts, which means you can send multiple emails to your customer within the dunning period. Chargebee's Dunning v2 works exclusively with Email Notifications v2. Configure the email notifications for dunning by navigating to Settings > Configure Chargebee > Email Notifications > Dunning for Online Payments/Dunning for Offline Payments. Here you'll find a list of emails that can be edited and configured before sending them to your customers during the dunning period. You can enable the email notification, edit the content and even configure when the emails should be sent over. 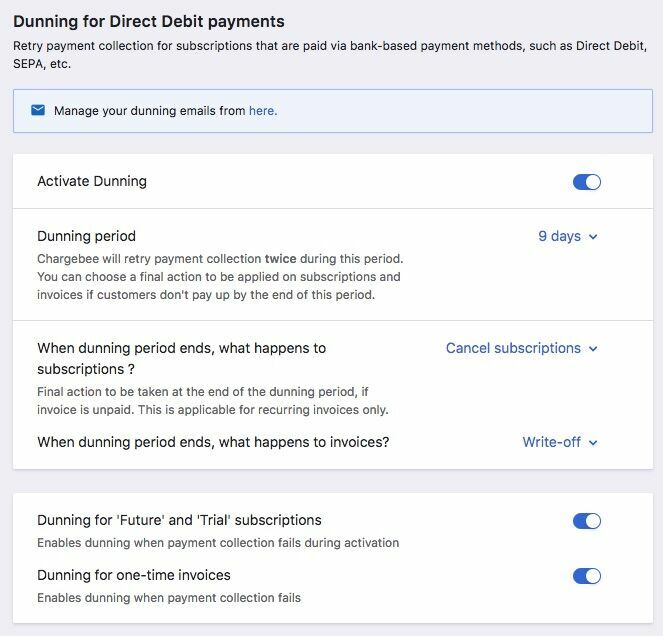 Chargebee will continue to send dunning reminder emails to your customers until the invoice is paid or until the dunning period expires. Email reminders for Direct Debit payment retries will follow the same schedule as that of online dunning reminders. However, Chargebee will not send email reminders for Direct debit payment transactions that are in-progress. Scheduled emails will be sent if the transaction fails.